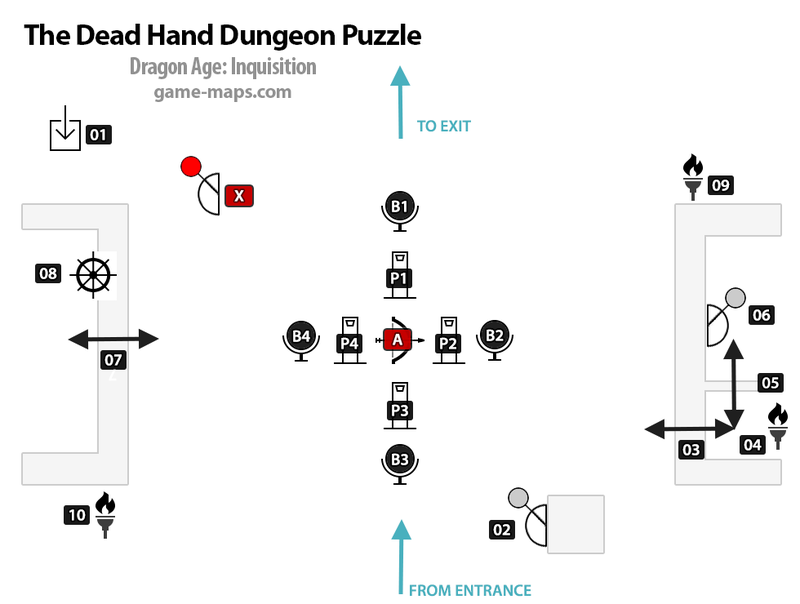 The Dead Hand Dungeon Solution - Dragon Age: Inquisition Walkthrough, Game Guide and Maps, with Quests and Locations. Go to the bottom of pit. Loot Codex entry on right. Loot Mosaic Piece on left. Now its time for puzzle, its looks crazy but its easy. First teach how to use "Hold Position" command to stay still party memeber when you need it. Puzzle in this Dungeon is to light 4 spheres (B1, B2, B3, B4) in the center shooting with Archer (A). Trigger to turn statue and shot with archer is in (X). Trick is that pillars (P1, P2, P3, P4) block arrows from hitting spheres. We should lower pillars and light spheres. Stand with one of your team members on press plate (01), split team and with second team member use (X), as many times as (B1) will glow. Pull down (02) to open (03) and stay here with first member. Move second member to (04) and stay. Pull up (02) to open (05) and stay here with second member. Move with second member from (04) to (06) and switch (06), now (07) is opened, stay here. Move third member to (08) and stay here. Move with fourth member to (X) and stay. Use third member to turn (08), hold as long and (P2) will lower. Switch to fourth member and use (X) to fire. To light last sphere you need to light 3 torches (04)(09)(10) at same time and fire with (X). So split four team members to this locations and fire. Examine Statue for Codex Entry.